12:00 a.m. on January 1, 2018 rang in not only a new calendar year, but also big changes to employment legislation in Ontario. The sweeping employment and labour law reforms ushered in by Bill 148: Fair Workplaces, Better Jobs Act, give Ontario workers greater protections and benefits. It’s been twenty years since the last significant review of the Employment Standards Act (ESA) and the Labour Relations Act. A lot has changed since then. These changes are intended to make labour laws compatible with the particular needs and challenges of the modern workforce. New parents can now take up to 18 months of parental leave after the birth or adoption of their child. In order to stay home longer with their new child, parents can extend their 12 months of federal employment insurance over an additional six months at a lower benefit rate. Additionally, mothers-to-be can now claim maternity benefits up to 12 weeks before their baby’s due date. Minimum wage has been increased by $2.40 from $11.60 to $14 per hour. This current wage is a pitstop on the way to the government’s ultimate goal of a $15 per hour minimum wage which is slated to come into effect 1 January, 2019. Employees who have been with a company for five or more years are now entitled to three weeks of paid vacation. Bill 148 has simplified the calculations for both public holiday and overtime pay. Now, public holiday pay is calculated based on the employee’s regular wages in the pay period preceding the holiday, divided by the number of days worked. Employees who work multiple positions with different rates of pay at the same company will now receive overtime pay at the rate of the role in which the overtime is worked. For example, if an employee ears $15 per hour for role A and $18 per hour for role B and they work overhours performing the work for role A, they will receive overtime pay calculated based on the $15 per hour wage of role A. Also notable about these emergency days is that employees are no longer required to provide a doctor’s note to support their requested leave. This is the first time all Ontarians will be entitled to paid sick days. This expanded eligibility come as welcome relief for the thousands of Ontario workers who have, in the past, found themselves at work despite illness and important family responsibilities because they could not afford to take the time off. These changes may contribute to healthier employees and therefore healthier and more productive workplaces. 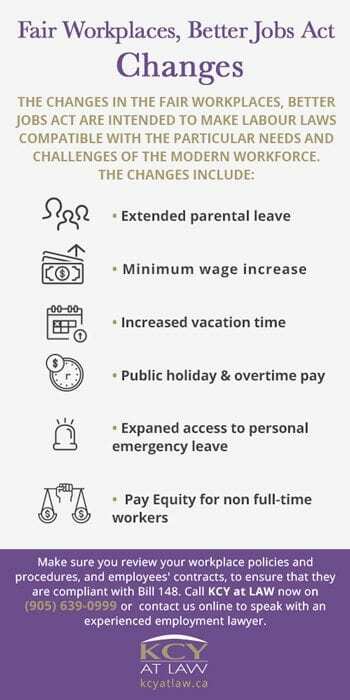 While equal pay for equal work is a rallying cry most people associate with the feminist movement, changes to legislation are concerned with equal pay for temporary, casual, part-time and seasonal workers in line with their full-time coworkers. This means that employers can no longer pay full- and non full-time workers differently for the same job. There are, however, exceptions to the rule. Pay systems based on seniority, merit or production quantity/quality may continue to pay employees different wages for the same work based on these systems. Equal pay legislation comes into effect on April 1. What does all this mean for employers? Hopefully: a happier and healthier workforce. 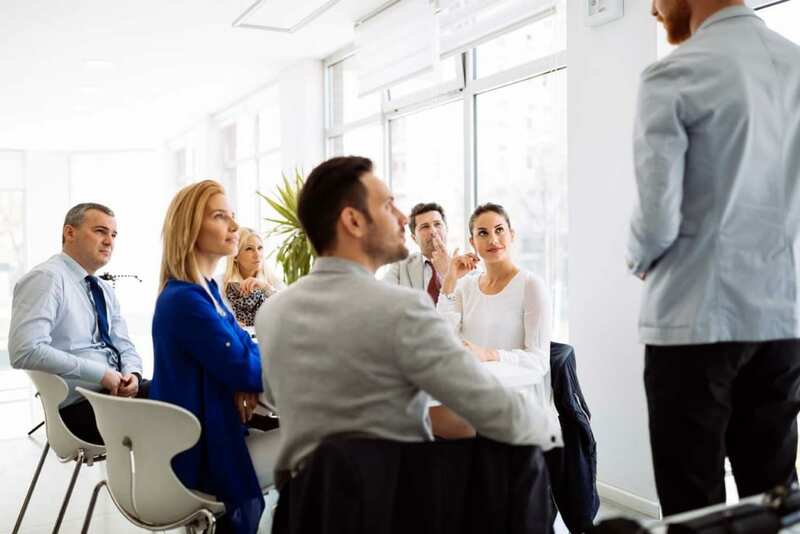 However, many employers will need to review their workplace policies and procedures, as well as their employees’ contracts to ensure that they are in compliance with Bill 148. Contact KCY at LAW to consult an experienced employment lawyer and ensure that your business or organization is up-to-date with current employment legislation. Give us a call now on (905) 639-0999 or contact us online.